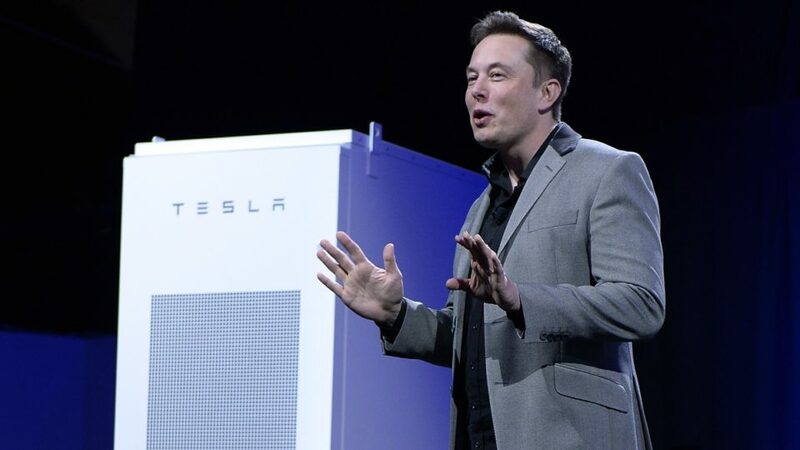 We’re now told the solution to the chaos delivered by wind and solar is giant lithium-ion batteries, of the kind peddled by Elon Musk. The reefer-smoking, Californian carpetbagger managed to offload one unit in wind power obsessed, South Australia, collected $150 million, and was never seen again. Here’s Liberal MP, Craig Kelly explaining just how brilliant a salesmen was Musk and/or what suckers South Australians must be. To keep the subsidies flowing and the public hoodwinked, green-rent-seekers have peddled the delusion that the intermittency of solar/wind can be solved with ‘’big batteries’’. This conjob was first sold in South Australia, as with their experiment of a 50% Renewable Energy Target descending into a costly farce, and to cover-up the fact they needed spend several hundred million on emergency diesel generators to keep the lights on just before the state election, with Hollywood fanfare SA announced they were installing ‘’the world’s largest battery’’ to save the day. And unsurprisingly, the green useless idiots of the left have swallowed this hook, line and sinker – as rent seekers continued to go laughing to the bank to cash their millions from subsidies. Well the performance of the ‘’world’s largest battery’’ last Thursday exposed what a complete con job it’s been – and delusion that we can power our economy on solar panels, wind turbines and big batteries is as dangerous to the economy as rabies is in a dog. 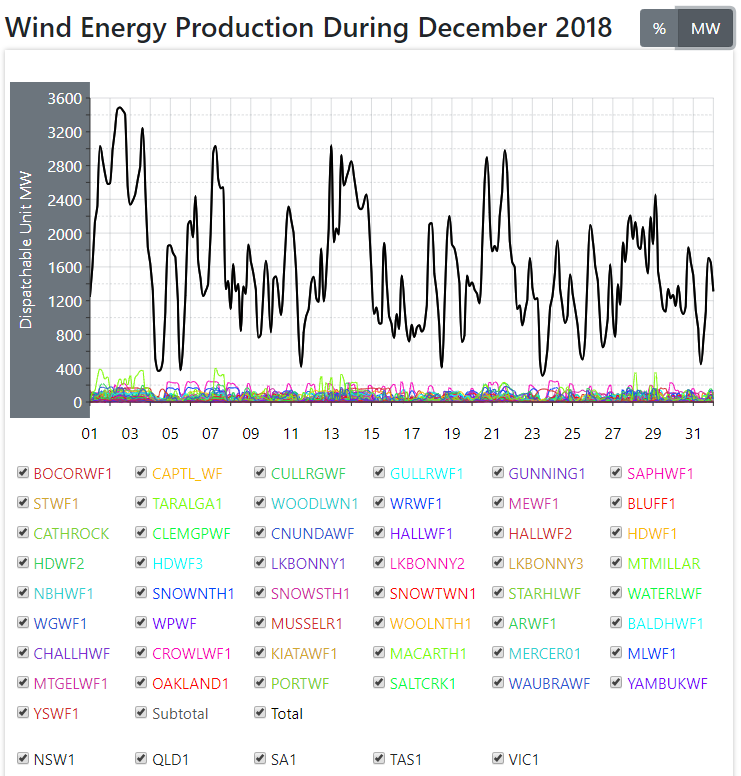 As wind power collapsed into the afternoon, prices in South Australia surged to $14,500 Mwh (they averaged around $40 Mwh before all these ‘cheap’ renewables flooded into the grid) at around 4.30pm ‘’the world’s biggest battery’’ started to dribble in 30MW to the grid. The 30MW was less than 1% of South Australia’s total demand, and less than 0.1% of the National grid’s demand. The world’s biggest battery continued to dribble out around 30MW until 7.30pm, then it ran flat, rendering it completely useless as peak demand hit at 7.30pm. 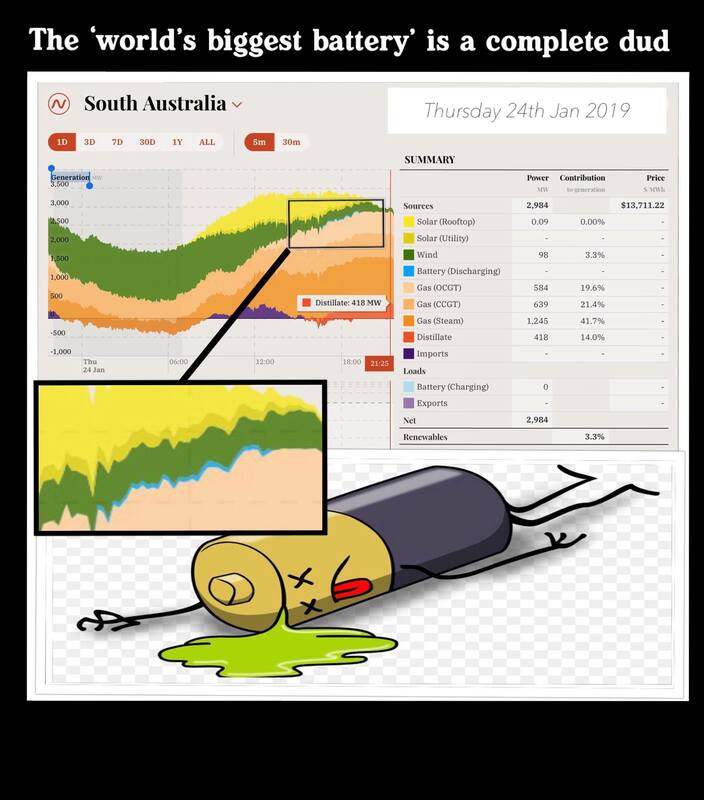 Meanwhile the emergency diesel generators (chewing through a reported 80,000 litres of diesel an hour) were doing the real work in SA, pumping out over 400MW at a time on demand – and they continued to so as demand peaked at 7.30pm, when the world’s largest battery had given up the ghost. So at peak demand, in the renewables paradise of South Australia, 97% of their electricity was coming from fossil fuels. Over the afternoon, I estimate the ‘’world’s biggest battery’’ delivered only around 100 Mwh of electricity – compared to 2000Mwh by the diesel generators. The facts should be clear from the evidence that it’s a dangerous delusion that Australia can run the economy with solar/wind backed up by big batteries. But sadly once leftists have been radicalised by green propaganda – evidence, engineering & economics no longer matter, because their belief is a semi-religious one based on feelings and emotions and their minds are closed to rational thoughts and logic. Californian huckster and friend, taking South Australians for suckers. « Crunch Time: Can Australia Escape its Self-Inflicted Renewable Energy Calamity Before It’s Too Late? Okay, I know I have a thing about what can happen with big lithium ion batteries and I don’t mean to be a nuisance so let’s park that one and go back to the money side of things. Forgive me if this seems too simple or silly. The wind industry would want to get money for charging the battery, who pays that? The battery person would want to get money for supply to the grid and/or for some stabilising of the grid frequency from part of the battery array (a partition). Who pays that? How was it explained this would be cheaper for the customer? It claimed that on the planning app for one over here in Tyrone. Todays (12.2.19) Advertiser story ‘Flood of bids for new big batteries’. While he says the Government is keeping an eye on technological solutions to solve this States energy problems including Telsa-style big batteries, pumped hydro as well as other such as hydrogen and thermal storage it is clear the Minister has taken to the big battery idea. Storage is OK, but if it relies on the weather then it is only good when it can be re-charged when the wind blows being at the whim of the weather. We are falling further and further into being a State that can only survive if we have gale force winds and sunshine every day with no cloud cover – that will obviously create a windy hot dry desert situation for the State – but ha why not if it saves the world!!! However, we expected the new Liberal Government to think differently and with more sense than the previous Labor one and look to create an environment where energy is produced and ready to use when it is needed without fear of blackouts and costs exceeding what people can afford. Its such a shame this man was given the job of Energy Minister in a Liberal Government, he should have stood for Labor as he is certainly following in their deep tracks to destruction of this State. What we want and need is security brought by a source on energy production that does not rely on the uncontrollable weather, we need energy production that can adjust to demands quickly and without having people, business and industry wondering when the next ‘lights out’ event will happen. I hope the **** hits the fan more often! The numbskulls that are all happy for this ‘free’ energy have no idea of the cost, no idea of the unreliability, and no idea of the damage to industry. I say let’s hope for more days like Victorians experienced on the 25th January. It seems to me that the sheeples have to be led by the nose so that they can finally see the lie that is renewable energy. How many blackouts are they willing to accept before they demand action? I only hope that no lives are lost due to power blackouts that are inevitable when relying on totally unreliable renewable energy. You wont need hot days soon, hot days merely highlight the limits of our generation. As our generation declines hot days will push us beyond our generation limits. Moderately warm days will push us to our generation limits. For example Torrens island in SA will shutdown two of 8 turbines early this year with two more soon after that. These are sub critcal turbines so only 400 odd MW they will be replaced by an OCGT generator, traditionally used for peaking power so expect another price hike in SA in the very near future. We are also building the worlds second biggest battery in another SA country town. Dont forget Liddle is still on the chopping block once that 1600MW is gone the eastern sea board will be in danger of collapse. Does anyone know the claimed storage capacity of this battery array in terms of MWH? Can anyone confirm the chemical make-up of the electrolytes, the anodes and the cathodes. In the case of a severe accident or abuse of the battery array, can anyone put a number on the amount of Hydrogen Fluoride or other toxicity category 1 gases or chemicals (per MWH charged & uncharged) in the resulting explosion or fire. I have no idea about Australian H&S laws but, at what levels of pollution are combined emergency service plans required? At what levels of pollution should public warnings and evacuation scenarios be invoked? On a point of curiosity, was the amount of storage capacity made public with the planning application? My suspicion is that this could produce between 2 and 20 tonnes of HF. I believe that dangerous atmospheric levels of HF are between 0.025 g/m3 (30 ppm) and 0.0139 g/m3 (170 ppm) depending on length of exposure but I am open to correction on this. I have a reason for asking these questions but don’t have the time to explain today. The claim is 130 MWh. if the battery array was abused by overcharging, fire or by damage, 130 MWH worth, could produce between 2600 to 26,000 KG of HF. That would be quite a gas cloud. Is there any likelihood of lightning in the area? Who would like to live within 10 miles of it? I don’t mean to be a scare-monger but I have to ask. Lightning is a risk, predominantly in summer. Nearest homes are within a few kms. I try and explain this stupidity to friends of mine who have been indoctrinated by the media, but it’s like water of a ducks back. They put their hands over their ears and refuse to listen. It’s impossible to get through to them, but hopefully one day when the **** hits the fan.